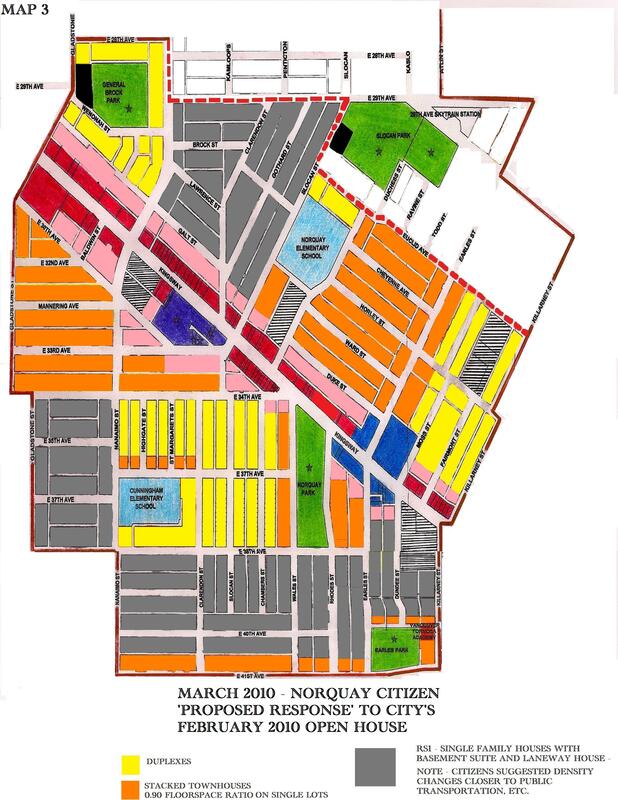 (April 26, 2011): Some residents in the Norquay area have received notice of an information session for new zoning bylaws in the Norquay Neighbourhood Centre. The new zones may set precedents for “new housing types” for all of the rest of Vancouver. Norquay residents earlier rejected the RM-1 and RT-10 from the first neighbourhood centre at Kingsway and Knight. But with these proposals it appears that zoning in Norquay will be even more dense than at Kingsway and Knight. Saturday, April 30, 2011 11 am to 3 pm, John Norquay Elementary Gymnasium, 4710 Slocan St. For more information click here. Planning processes have been on and off in the Norquay area of East Vancouver for five years. In February the City held another open house for public input on major changes proposed for this area. Friday, March 11 is the deadline for public comment. We encourage citizens to read our main post today here, and submit comments to the City. What happens in Norquay is important for all of Vancouver. For a citizen-run website on these issues, please visit http://eyeonnorquay.wordpress.com. (Jan 7, 2011) Download and read this essay by Joseph Jones, titled “Norquay ‘Planning’ in Vancouver: Five Years of Top-Down Manipulation. A Presentation to Grandview-Woodland Area Council on 6 December 2010. He begins thus: After almost fifty years, I have just gotten around to rereading ａ novel that did something to make me what I became. Catch-22. Try to take what follows in that spirit of unrelenting black humor in the face of unremitting adversity. Laugh and weep. What follows consists of: * Brief introduction * Three phases of Norquay planning in outline * Ａ surrealistic interlude * Ten quick points * Brief conclusion. Hang on for the ride. About five years are crammed into about twenty minutes. As the City of Vancouver discusses neighbourhood planning, we need to learn lessons from the past and apply our collective experience to future decisions. How can we move forward with open, transparent planning processes that serve the long term interests of everyone in the City? As one part of this puzzle, we must examine the story of Norquay Village. This web page carries key information about the five-year process of the Norquay Neighbourhood Centre Plan. This story requires some narrative, which we will add in time as we follow this story. 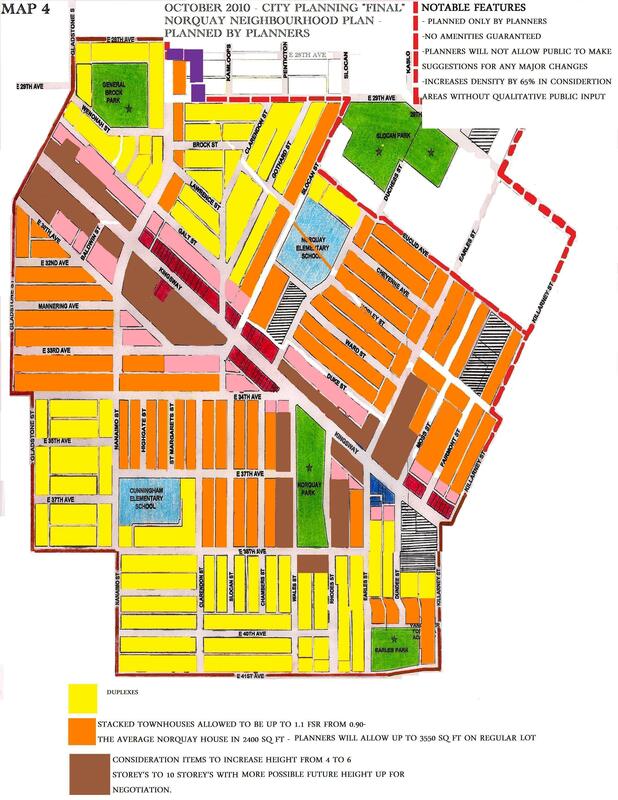 The Norquay Village Neighbourhood Centre Plan was approved by majority vote in City Council on November 4, 2010. Agenda and staff report actually presented to Council are for download here. Video and minutes of the meeting are here. Is Norquay an example of how planning is NOT working? Read on, and you be the judge. This page is open for comments (see bottom). 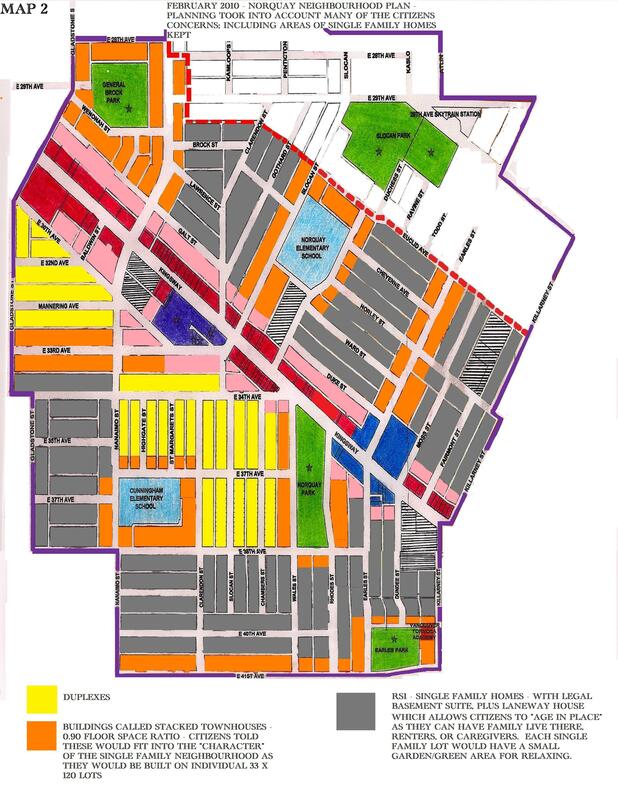 The city is proposing to rezone a huge part of this neighbourhood, covering 2400 properties. The plans have been rejected by the community for 3.5 years, but two weeks ago (mid-Oct 2010) the City’s Planning Department raised the proposed zoning height here up to 10 storeys without further public consultation. In this community a large percentage of residents do not speak English as their first language and 33 percent are at the low income level. Norquay Neighbours has provided much of this material. It is a group of concerned neighbours that formed years ago to discuss the Norquay Neighbourhood Centre Plan and to keep the neighbourhood informed on developments. The group has used money from donations and from group members to hold community meetings and distribute leaflets to every residence in Norquay regarding the Neighbourhood Plan. All are volunteers. Below are four maps that show the process of the proposed plans, from 1997 to present. They show that the plan is right back to where discussions started years ago, but with more DENSITY and still NO GUARANTEED AMENITIES. Norquay Neighbours really thought with MAP 3 the city would be in agreement, because it even added density, which was expected to satisfy City Council. 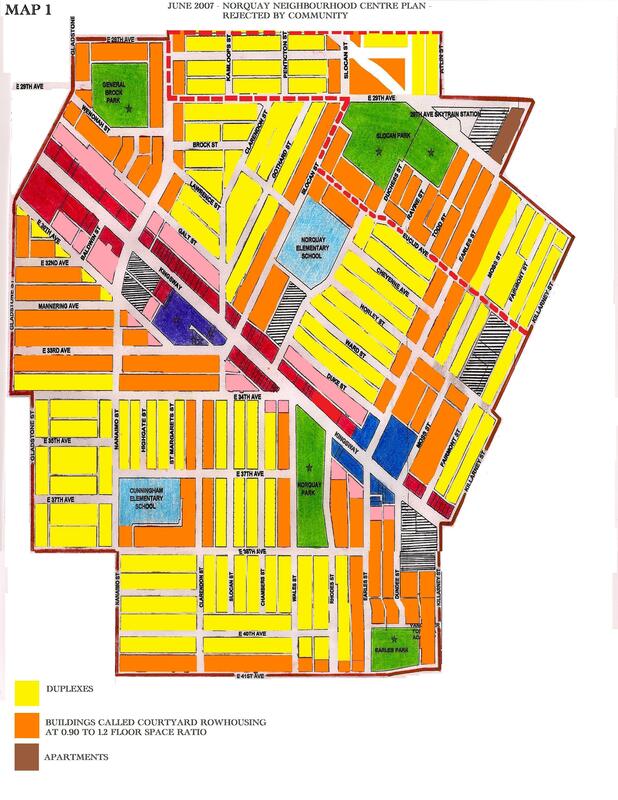 The Planning Department, however, seems to have different marching orders than the MAP 2 they presented earlier to the community, and appeared to just stall for time to bring out their real plan. Meanwhile, citizens who have committed huge amounts of volunteer time, working in good faith, are disappointed, frustrated, and exhausted. How can this situation be fixed and trust be regained? Aspects of this story are Vancouver’s great freeway debate all over again – no serious citizen input considered, and the City Planning Department proceeding at high speed, only slowing when challenged. Planning processes have been on and off in the Norquay area of East Vancouver for five years. In February the City held another open house for public input on major changes proposed for this area. Friday, March 11 is the deadline for public comment. We encourage citizens to read on and submit comments. What happens in Norquay is important for all of Vancouver. For a citizen-run website on these issues, please visit http://eyeonnorquay.wordpress.com. Text below is from the writer of Eye on Norquay.